"Quando ho realizzato il mio nuovo studio, ho voluto espressamente che potesse essere comodo anche per Robert Wyatt: infatti quando registra i suoi album, praticamente vive lì... Robert, Alfie, io e mia moglie siamo molto amici: per me è un musicista straordinario, un meraviglioso pensatore e la sua musica è davvero molto speciale. Recentemente ho partecipato a un bel documentario della BBC sulla vita e la carriera di Robert. Fortunatamente negli ultimi anni la sua attività è stata abbastanza riconosciuta: finalmente può davvero essere considerato una sorta di tesoro nazionale! Nei prossimi mesi dovrebbe venire nel mio studio per registrare materiale per un nuovo album..."
Sarà bene metter da parte qualche soldino per acquistare in blocco i nuovi titoli (maggio 2006) Cuneiform. Difficile di questi tempi pensare a un set di uscite discografiche altrettanto entusiasmante. Bravo Steve Feigenbaum! Bassist Harry Miller was born in South Africa, but he was the Brit-jazz bassist throughout the 1970s, playing with John Surman, Centipede, Mike Westbrook, Keith Tippett, Mike Osborne, King Crimson, Julie Tippetts, Alan Skidmore and Chris McGregor's Brotherhood of Breath, among many others, as well as co-founding the legendary Ogun label, which did so much to document the Brit-jazz scene in the 1970s. Harry's group, Isipingo, which he led for a number of years, could be compared to a smaller-scale, more "swinging" take on the wonderful kwela-influenced jazz of the Brotherhood. The band includes six of the greatest of Britain's jazzers of the mid 70's: Nick Evans-trombone, Mongezi Feza-trumpet, Harry Miller-double bass, Louis Moholo-drums, Mike Osborne-alto sax and Keith Tippett-piano. Which Way Now features over 70 minutes of music from a beautifully recorded radio concert from November 20, 1975; it sounds as if you are in the room right with the band! The package includes a 16 page booklet with a number of stunning, never-before seen photos, as well as extensive liner notes by Francesco Martinelli. Since Isipingo only released one album during their lifetime [re-issued in the 3CD Harry Miller box on Ogun], this release dramatically extends their legacy and like Cuneiform's important and historical work with the Brotherhood of Breath, brings this hugely enjoyable, nearly-forgotten music to a new audience. SOFT MACHINE [MIKE RATLEDGE, ROBERT WYATT, HUGH HOPPER, ELTON DEAN] - Grides [CD + DVD] (Cuneiform 230/231; USA) a CD/DVD package with a great concert from 10/25/1970 on the CD AND a 20' DVD of the band on the German Beat Club TV show in March, 1971, which includes 8' of footage shot but never broadcast and taken from the original master video tapes for the best quality! "In arranging Zappa's tunes for big band, Ed Palermo has thrown new light on his legacy while retaining the composer's original melodic and harmonic designs. The arrangements also leave plenty of room for the band's gifted soloists..."-The Washington Post. Ed Palermo is an alto sax player and arranger; he has had a big band for twenty-five years, which is an impressive feat in itself, and has had his band performing the music of Frank Zappa for over a decade. Years and years of playing these pieces in front of enthusiastic crowds at a number of venues in New York City and beyond have honed the band's skills with this difficult material to where they can glide through these charts as if they were butter. 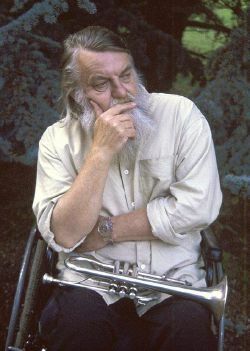 There are a number of ensembles performing the music of this great 20th century American composer, but no one does it with this ease, skill and originality; Ed is not afraid to turn a piece into a salsa number (the title track) or to take what was a one minute miniature and to develop it out into a six minute work. The band is a 15-piece ensemble of 6 woodwind players, two trumpeters, three trombonists, two keyboardists, bass and drums, plus a few guests. All of these musicians are NYC professionals, and they have been playing this music for years with Ed, because, like Ed, they recognize and appreciate the genius inherent in the huge body of Zappa's work, and they want to keep this great music alive and in front of the public. "[Palermo's] wisely chosen to emphasize Zappa's early and mid-career work, as that's the music which is more fluid and graceful--and more apt to swing ....reveals the lighthearted playfulness and rhythmic intelligence at the core of Zappa's best work..."-Downbeat. HAMSTER THEATRE - The Public Execution of Mister Personality/Quasi Day Room [2 CD set] (Cuneiform 226/227; USA) "...a highly skilled chamber ensemble...offering a literate synthesis of rock, jazz and European folk forms. You can't really put this music into a tidy little compartment, but it's unforced, sophisticated and highly entertaining. "-Alternative Press. Hamster Theatre straddle the edges of folk music, avant-garde, world music, early 20th century French composers, such as Erik Satie and Maurice Ravel, contemporary composition and many other musical forms, bringing together elements of all these styles while never sounding 'just like' any one of them. Using an instrumentation of accordion, keyboards, trombones, saxophones, clarinets, flutes, guitars, mandolin, bass, drums and percussion, their pieces are always filled with delightful melodies and surprising orchestrations. In addition to the new studio album included here, there is a second disc of the band's stupendous live performance from August, 2002 at The Moore Theatre in Seattle. This CD is a perfect compliment to the studio disc, as it shows the amazing performance that 'the Hamsters' can put on in a live environment; Hugh Hopper called this performance, "Some of the most interesting music and one of the best live shows I've seen for years." Both discs were mixed by Bob Drake, the noted musician/composer/producer/engineer. 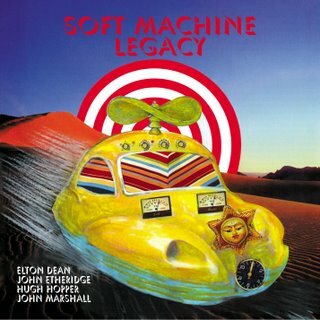 Esce in questi giorni un doppio CD di Soft Machine Legacy registrato a Parigi il 12 dicembre scorso. Lo pubblica inakustik con il titolo THE PARIS CONCERT - THE 40TH YEAR JUBILEE CELEBRATION, annunciandone una imminente versione anche su DVD. As a celestial phenomenon neighboring the musical big bang of the Sixties, The Soft Machine Legacy echoes the melodious growl of an era when rock'n'roll, blues, jazz, jazz-rock, funk, soul, pop were, as yet, nothing more than a magma of sounds challenging the musicians' ability to shape the course of music to come. In those days, Soft Machine symbolized the uncompromising dialog between those rock and jazz musicians who were determined to create a synthesis of the untamed energy of rock and the improvisational thrust of jazz. 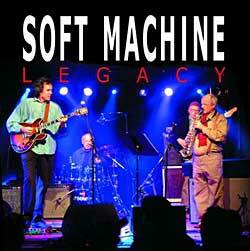 Forty years later, The Soft Machine Legacy musicians have not forsaken their dreams. Immune to the leveling pressures of show biz, Hugh Hopper, John Marshall, John Etheridge and Elton Dean - who died shortly after this last reunion at the New Morning - still mesmerized their fans. Whether the cheeks be rosy, or the heads speckled with grey: freedom is ageless.